DAVID BIRD, one of the most charismatic and powerful angling spokesmen and campaigners of the past 30 years, sadly died on August 18, 2010. A regular in Angler’s Mail during the 1980s and 90s, David represented angling on so many levels, and was famously President of the National Federation of Anglers – a position he rose to through popular support. A Londoner, who also proved a popular leader with East Sussex club Rye DAS, he had the wider interests of angling at heart. As Part 2 of our special tribute to David, we re-publish our Inside Line interview with him. It first appeared in print, in Angler’s Mail magazine’s September 20,2005 issue. The Specialist Anglers’ Alliance chairman talks on where angling politics is at today (or more precisely, 2005). 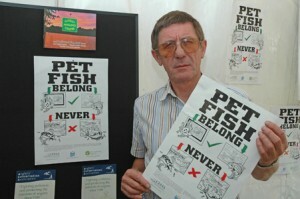 David Bird in 2005, promoting a poster campaign against dumping of pet fish into the wild. He died on August 18, 2010. Are you succeeding in uniting angling through this new umbrella body, FACT? Fisheries and Angling Conservation Trust has been a major breakthrough in uniting anglers and angling but also fisheries. It has been overdue because fisheries and fishing are inter-related. What affects one will affect the other somewhere down the line. All national governing bodies who historically have dealt with situations on their own are now much better at co-operating. FACT was created because Government wanted to deal with only one organisation, as they do in other sports. How much progress has been made pursuing the cormorant problem? Lots of progress, the work by Terry Mansbridge of the Moran Committee’s Bird Group has been a great success in raising awareness of the problem with increased licenses made available to cull. Sadly the Royal Society for the Protection of Birds won’t share our realistic view of sensible, achievable management of the problem. What are the biggest ongoing threats to angling? Still the anti-angling factions and the extreme activists who threaten with terrorist tactics. Also, the public’s lack of awareness of the difference between animal welfare and animal rights. The public can be easily sucked in by warped propaganda. I’m concerned that within the angling media certain individuals are polishing their egos at the expense of the sport, issues being raised which are best not aired in public and better resolved behind closed doors. And, in a nutshell, what is most threatening to aquatic environments and fisheries? Global warming is a real problem and will change the nature and make up of fisheries, inland and offshore. How come when it rains for a day England floods and after a week of sun the rivers are dry? Flooding is caused by building on water meadows. Everybody wants to live by a river. The normal process of slow flow of water into rivers following heavy rainfall has been seriously interrupted. We get flash floods which are very destructive, for people and homes through to fish populations. In extreme dry spells we are constantly caught out through not having looked ahead and planned for better water storage. Water shortages were on the agenda ten years ago. To create reservoirs now we will have to suffer public inquiries that will take years and millions of pounds of public money. We need to address the problem now. The situation can only get worse with government plans to build hundreds of thousands of new homes that will all need a supply of water. How long until we have the same political power as the bird lobby? We actually have great political clout with this Government. Since they’ve come to power and with the appointment of Martin Salter as angling’s MP we have achieved an awful lot. We have regular angling summaries with Ben Bradshaw, Minister of Fisheries and with pour joint approach have had a number of successes. As soon as we can create long-term sensible funding strategy for FACT. We need to employ professionals that we have lacked in the past to give us a coherent and professional relationship with press, government and public. Why does bird group, the RSPB, remain so powerful? Because they’ve got a budget of over £40 million a year and employ specialists to work effectively in each of these areas. Angling runs on happy amateurs like me. Anglers need to pay what we’re worth if they want better fisheries and protection. You were president of the National Federation of Anglers back in the early 1990s. How do you see their involvement in angling politics these days? I’m greatly encouraged, they have a new professional team on board and in the past year have had a strengthened relationship and meaningful dialogue with the Specialist Anglers Alliance. Aren’t most anglers turned off by politics – whatever you say or do? Absolutely and I don’t blame them. Angling is the last mass escapist sport. People don’t want to get involved. I defend their non involvement and lack of interest in joining something. But somewhere they will have to contribute and let angling politicians do the work that needs to be done. A 2 oz dace on the Bridge Pool at Christchurch while fishing for sea trout with double lobworm. 20 Japanese super heavy trolling pirks for fishing for yellow fin tuna and trevally in Kenya. At over a tenner a throw you don’t want to lose too many. * David Bird was talking to Colin Davidson. Watch out for insightful Inside Line interviews in Angler’s Mail magazine every week. Have you read part 1 of our tribute to David Bird? It’s online in our news section.